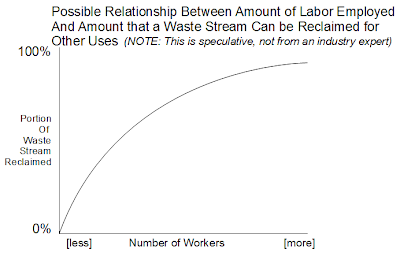 Thought Offerings: The Ultimate Job Guarantee Implementation: Can we Achieve Zero Wasted Labor AND Zero Material Waste Simultaneously?!? Hbl, Mixing up two objectives (e.g. raising employment and protecting the environment) nearly always leads to a misallocation of resources. If environmental considerations dictate that the maximum permissible consumption of commodity X is Y tons a year, then commodity X should be taxed at such a rate as to bring about that maximum. That will AUTOMATICALLY make it worthwhile to do a bit of “commodity X recycling”: maybe using JG labour and maybe not: in fact the best way to do it might be a highly capital intensive way, using very little unskilled labour. In contrast, if JG labour is concentrated in the recycling business, that will quite likely result in an excessive amount of recycling being done. Plus it will likely result in forms of recycling which are less efficient than other methods. BTW: I just love rummaging through dustbins and heaps of trash to see what I can find. But then I’m eccentric. "Mixing up two objectives (e.g. raising employment and protecting the environment) nearly always leads to a misallocation of resources." I think that's a big risk when the objectives are simply correlated (and certainly when they may be in conflict) but in this case one provides a direct solution to the other. (i.e., Labor solves tasks that we've ignored because they require "too much" labor). "If environmental considerations dictate that the maximum permissible consumption of commodity X is Y tons a year, then commodity X should be taxed at such a rate as to bring about that maximum." The textbook theory sometimes is applicable -- for example it appears to be helpful in regulating industry -- but there are always limitations with making this work in the real world overall. In the US, even the small tire disposal tax causes a lot of tires dumped in local creeks, for example! 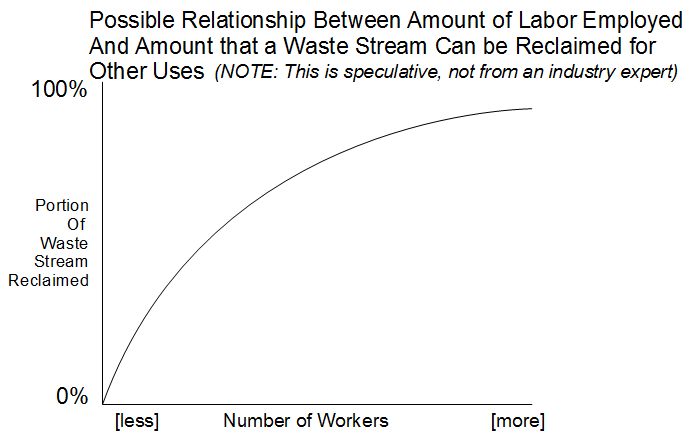 And at least in the US neither the commodity inputs that go into products households buy nor households' waste stream seems to be taxed in a way that can incentivize a reduction of the material flows that are most "worthwhile" to reduce. Perhaps there is a way to be successful this way, but until it is found, I've suggested another way of addressing those costs. "That will AUTOMATICALLY make it worthwhile to do a bit of “commodity X recycling”: maybe using JG labour and maybe not: in fact the best way to do it might be a highly capital intensive way, using very little unskilled labour." 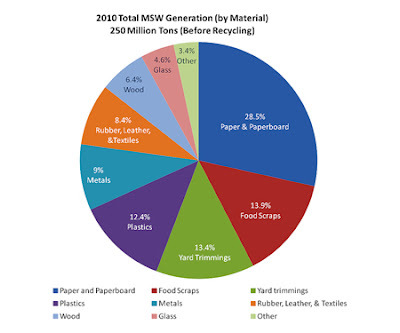 Well the US already does have a third of its waste stream being recycled, often with automated sorting equipment. So wherever worthwhile, such practices definitely should continue and even expand! But what do you do with what's left, and what is it costing society in hidden ways? "In contrast, if JG labour is concentrated in the recycling business, that will quite likely result in an excessive amount of recycling being done. Plus it will likely result in forms of recycling which are less efficient than other methods." I suspect industry experts could analyze what the costs of additional recycling of waste flows would be (outside the cost of JG labor, which we already know from MMT is "affordable" to the federal government) plus the revenue that can be obtained from those reclaimed material flows, and compare to the costs of waste disposal as it is currently handled. Of course it's hard to price the cost of incinerator air pollution, loss of real estate to land fills, etc. "BTW: I just love rummaging through dustbins and heaps of trash to see what I can find. But then I’m eccentric." Actually I think a lot of people find fascination in the trash of others... after all "one person's trash is another person's treasure". Safety and condition concerns are a serious issue for this type of proposal, but I'm actually not sure that people would hate the work -- it might be very engaging to many! And anyway, there is already an "informal" waste industry in poor areas that involves scavenging from trash... why not pay people for it if it helps society? I think this is a brilliant idea, and I think would require JG workers to learn more and more skills, as this probably requires at least some training to understand what can be placed in what recycling bin etc, and the more training the better. Participants may also find this a career opening into more interesting parts of the rec ycling industry. Yes, I agree that there might be some meaningful training opportunities... especially when it comes to learning to disassemble more complex products. There are already unofficial recycling facilities run by enthusiastic individuals that use small armies of volunteer labor to break apart shampoo bottles to separate the types of plastic, etc, and I think they eventually seem to find buyers or re-users for most of the materials they separate. If not they make art out of them! Such skills might be useful background for private sector jobs in construction, manufacturing, or other industries. At the very least there is the maintenance of work habits tied to solving real world problems in a group setting. Love the idea. Thank you. More please! Really nice idea. Doesn't even have to be part of a JG. "a federally funded but locally administered minimum wage job." MMT does not require that the JG be locally administered. That is a political issue, not an economic issue. I personally would prefer the JG be administered at a national level, similar to the WPA or any other Federal agency. There is already quite a bit of sorting and recycling going on in some parts of the country, both private and public. Sorting the material is one part of the job, then it has to be bundled or crated and shipped to a processing plant. Scrap prices vary and it's not necessarily profitable to ship and process things like tin cans or glass, even if you had free sorting labor. Random scraps of paper and plastic such as you find in household trash are generally not recyclable. Mainly you'd be looking for aluminum, copper, and brass. All that said, I'd certainly be OK with having a sorting operation at the local landfill, to pick out aluminum, copper, brass, and possibly steel, depending on scrap prices. It would create a few jobs, but not very many, certainly not nearly enough jobs to soak up the local unemployed -- a dozen people would be plenty for the typical county landfill. Along the same line of thought, an obvious JG job would be picking up trash along local roads. This is already being done to some extent by volunteers or by jail crews, but there are many rural roads that are neglected. The aluminum cans picked up could and should be recycled. "MMT does not require that the JG be locally administered..."
Local administration seems to be the design typically suggested by the MMT originators, but I agree it may not be a requirement. "There is already quite a bit of sorting and recycling going on in some parts of the country, both private and public." Agreed. There are even privately run recycling centers run by volunteer labor who offer their time simply to make a difference! That was one of several inspirations for this post. "Scrap prices vary and it's not necessarily profitable to ship and process things like tin cans or glass, even if you had free sorting labor." I don't think narrow measures of profitability are appropriate for a government run program serving "public purpose" such as the one suggested here. There would be large reductions in external costs "elsewhere" in the economy and environment -- such as reduced harmful side effects of mining, forestry, etc. Plus of course the societal benefits of reduced unemployment. But all that is admittedly hard to measure! "It would create a few jobs, but not very many, certainly not nearly enough jobs to soak up the local unemployed -- a dozen people would be plenty for the typical county landfill." Perhaps you are correct and if so, then this idea might not be practical on a large scale. I don't have in depth knowledge of the industry so I am definitely interested in this type of feedback -- thanks. But I also wonder if there is a lot more product dis-assembly (electronics, furniture, etc) and reclamation of more marginal materials that a JG approach could "afford" than would be profitable for a for-profit waste management conglomerate. Well, JG may help in dismantling used electronic hardware, recovering the still-operable parts to add to the facilities needed for further item recovery (like circular clamps for the wires, for instance). The rest can be recycled for other purposes or broken down to be reused in newer products.